FACTS: Very large for a Dune Tiger. Could easily carry Kumo when needed. Though, Kumo usually walked alongside. Across his back he wore a harness. On one side was strapped Kumo's sword and on the other a large canteen for water made out of a Sand Cobra's Hallow fang. FACTS: Son of Arai. Inherited sire's size. Wears the same type of harness and can also be used for riding. "The look of an elf who has been to hell and fought his way back out. "~Halban's description of Kumo when he returned after 75 year absence. HAIR: Black, hangs to the back of his knees. A short beard and mustache. SCARS/DISTINCTIONS: More then you can count. He has deep scars around his wrists from the manacles he wore the years he spent as a slave. Across his back are countless lash marks, wasn't a very obedient slave. Had a large scar across his face and the one that bothers him the worse is the missing pinkie on his left hand. 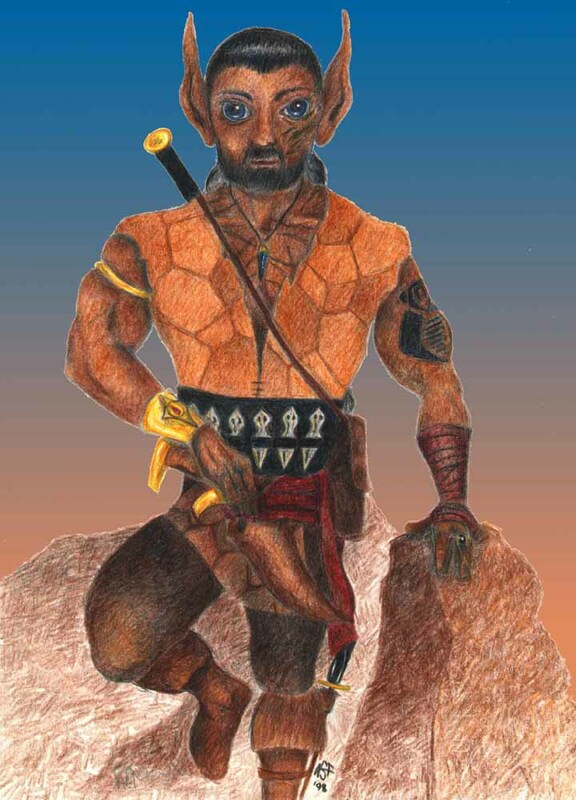 BUILD: Years of working in the human mines and wielding a sword almost twice his height has turned this once lanky elf into a brawny, muscular, swift warrior. CLOTHES (SUMMER AND WINDER):Kumos's outfit is not meant to be flashy. He does wear a lot of snakeskin. You'll find it makes up his knee high boots and sleeveless shirt. His pants are made from leather, as is the breechcloth that adorns them. His left hand is wrapped frowm the wrist down and around his palm to hide the scar of his missing finger. Has numerous knife sheathes on his person, including one on his wrist and another on his leg. A red sash around his waist holds another knife in place. He wears a poncho, when out and about in the desert. (Kumo's history has many gaps in it. Some because he does not remember, others by choice.) The first 500+ years the world was Kumo's playground. He and Kigen, his soul brother, made it their goal in life to conquer every danger that came their way and every eligible female. Then came the Slaughter. This once fun loving elf was thrown into a world of rage and insanity that lasted almost four decades. He became a roaming hermit, bent on destroying anything that stood between him and his next step. His days and nights were taken up with an endless urge to annihilate. It was during this time that he came across a band of humans (Not of Ishmar). He had killed humans before on this journey so he did not hesitate to kill again. This time, though, there were just too many and he was overpowered. The band of humans lived on the edge of the desert. They brought Kumo to a strange lush land they called a forest. Once their they bound his wrists in iron shackles that he would wear for almost twenty years. The humans put him to work in their gold mines. It was one of the human slaves, Finn, which helped bring Kumo out of his insanity. Kumo and Finn decided to escape one night after the murder of a fellow captive. They were caught. The humans considered Kumo too valuable and only beat him senseless for the attempt. Finn, though, was killed in front of the others as an example. that act brought back the rage that had been under control. Many slave masters lost their lives that night... and Kumo once more roamed the desert. The injuries from the beating and escape took their toll on the elf. As Kumo struggled across the sands he came across two abandoned Desert Tiger cubs. One was already dead and the other close to it. Kumo found the cub some water and decided they could die together if that was their destiny. He named the cub, Arai. The time between finding the cub and returning to the Holt was a span of almost fifteen years. How did the twosome survive such grave injuries...what happened during that time...Kumo has not said. What others do know, is that during that duration that he learned to use a sword. What else happened? Maybe he will reveal it in time...or maybe not! After returning to the Holt he and Kigen had to learn to be friends all over again. Then there was that little matter in regards to Shima, she HATED him. It took a long time for Shima to warm up to her older brother. Now, though, they are very close. PERSONALITY: Used to be a lighthearted elf and prankster. Still the prankster but has seen too much to be called lighthearted. The rage he has fought so hard to control will still unleash itself in the heat of battle. But the touch of any loved one will quickly bring it under control. He is just starting to enjoy life again. SKILLS: Since a sword is his chosen weapon, he has a certain stealth to his hunting skills. He has to be able to get close to his prey. He is a very good hunter. Not sure if rage is considered a skill but once he exceeds his tolerance level, Kumo becomes a killing machine. OUTLOOK ON LIFE: Kumo never intended on becoming a Warrior. Heck, a thousand years ago elves did not even have a word that meant warrior in their vocabulary. He rather avoid confrontation, because once started the rage inside might be unleashed. He will not run from a battle though. Kumo hopes Akan and the other children might be able to grow up without fear of the Priests and is willing to fight for that day. He also keep an eye on his sister who is too busy watching over everyone else to be concerned about herself. LIKES: Annoying Shima, a finally crafted blade, hunting along side Kigen and a good roll in the fur with a female. DISLIKES: The Rage inside him, Runners, and not being able to find Kigen. Doesn't hate all humans, just dislikes what they stand for. IMPORTANT TO REMEMBER: Kumo is not a raving maniac. In fact, only a handful of elves know about the Rage inside him: Kigen, Shima, Ame, Onsha, and Sharana. (pretty sure as the war goes on, more will find out.) His bond beast, Mizu, is uncommonly gentle, especially around children of the tribe. Though, when needed, the tiger can be very fierce.